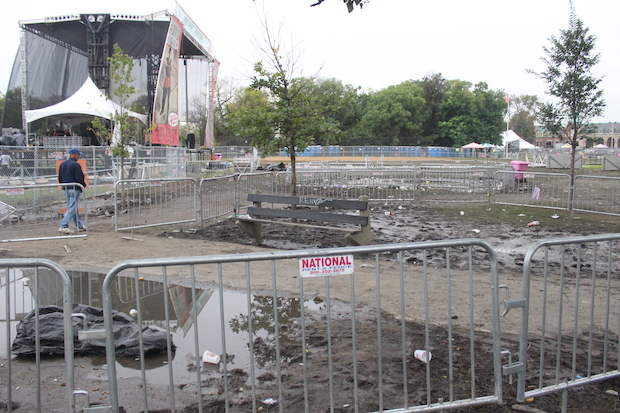 HUMBOLDT PARK — Riot Fest caused $182,000 in damage to Humboldt Park this year — more than three times last year's cost. That estimate was made after a walk-through by city officials days after Riot Fest ended last month. The $182,000 repair bill “will be paid for by the festival organizers and not the Park District," according to Chicago Park District spokeswoman Jessica Maxey-Faulkner. “The Riot Fest organizers will hire a private landscape contractor to repair damage to the park,” she said via email, adding that the contractor must meet Park District specifications for the type of work involved. “Repairs will begin this week, and we expect the initial repair work to take about a month,” she said. “The vast majority of Humboldt Park is currently open for activities and will remain open during repairs. Some areas will be fenced off during repairs to allow for the cultivation of the grass." The fest racked up $54,300 in bills to repair the park last year, when the event was roughly one-third the size of this year's. This year, portable toilets, trash and hordes of seagulls remained at the Humboldt Park site in the days after the fest, as crews cleaned up from the punk fest that drew about 160,000 fans to the park from Sept. 12-14. The Riot Fest footprint this year nearly covered the entire park, from Kedzie to California avenues and from North Avenue to Division Street, according to Maxey-Faulkner. Riot Fest organizers issued a statement Sept. 17 vowing to not only clean up the mud and trash-filled Humboldt Park, but to make the park better than before.